Zinc lozenges are a popular remedy for a cold. But do they really work? For years, scientists have conducted studies on zinc. And for years they've gotten conflicting results. Some studies showed that zinc works. And some studies showed it doesn't. The researchers looked at all the different factors that could have affected the outcome of the studies - what kind of zinc, what form it was in, what dose… everything. When all was said and done, they finally had some answers about zinc that made sense. There are several kinds of zinc that you can take for colds. But only two kinds of zinc are actually effective against colds. The best kind is zinc acetate. It's the only kind of zinc that consistently slashes the duration of a cold in half. Zinc gluconate was the second best choice, but zinc acetate worked much better. Why are zinc acetate and zinc gluconate effective and other kinds aren't? Because they both release zinc in the form of a positively charged ion. The ionic form is what makes the difference in whether zinc can cure your cold or not. How does ionic zinc cure your cold? Well, first, zinc is a powerful antiviral agent, especially against rhinoviruses. Next, ionic zinc helps your white blood cells fight cold viruses, too. It boosts their production of interferon-gamma, which is your body's primary defense against all viral infections. Ionic zinc also stops the cold viruses from spreading in your body. You see, cold viruses get into your cells by attaching to a microscopic molecule that moves between cells. The molecule is called ICAM-1. And if a cold virus attaches to it, ICAM-1 smuggles the virus inside the cell. Ionic zinc blocks this process and stops cold viruses from entering and infecting your cells. And finally, ionic zinc fights colds by minimizing stuffiness, congestion, sneezing and a runny nose. How? It inhibits the release of histamines that trigger those symptoms. In other words, it behaves just like the antihistamines some people take when they want to get rid of a runny, stuffy, congested nose. Once researchers learned that ionic zinc was more effective than non-ionic zinc, they wanted to know which compound was best at releasing zinc in its ionic form. They wanted to know what dose was effective. And they wanted to know which form was best. As I mentioned above, they discovered that zinc acetate was best. Zinc acetate releases 100% of the zinc in an ionic form. Zinc gluconate was second best. It only releases 70% of its zinc in the ionic form. The researchers also found that you need at least 75 mg of zinc acetate a day to fight colds. And finally, they found that zinc is only effective when cold viruses are exposed to zinc for at least 20 minutes at a time. Since zinc needs 20 minutes of exposure to fight colds… pills, syrups, or sprays simply won't work. You need slow-dissolving lozenges that release the zinc right where the viruses are. Other common forms of zinc (zinc citrate, zinc glycinate, and zinc tartrate) release little to no ionic zinc. As a result, they are completely useless for fighting colds. And don't be fooled by combinations, either. If you choose a product that combines zinc gluconate and zinc glycinate, you're wasting your money. Not only do you get less zinc gluconate per dose, the glycine interferes with the release of ionic zinc from the zinc gluconate. Only 57% of zinc is released in ionic form. That's way less than the 70% released by zinc gluconate on its own. And it's even worse when manufacturers combine zinc gluconate with zinc citrate, zinc aspartate, or zinc tartrate. These combinations result in 0% of the zinc being released in ionic form. That's right - zero. No wonder so many of these zinc remedies don't work! And finally, when you're selecting lozenges, check for palm kernel oil and cottonseed oil. If either of these oils are in the ingredient list, don't waste your money. Why? Because they bind to zinc during the manufacturing process and prevent it from being released in ionic form. Suddenly all of these conflicting study results make sense, right? As soon as I read the meta-study, I knew exactly what kind of zinc to recommend to my patients and readers- zinc acetate, in lozenge form. But there was just one problem with zinc acetate lozenges. I couldn't find any that were commercially available! That's why I turned to my friends at Advanced Bionutritionals. 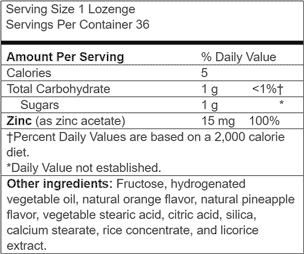 I shared what I had learned about zinc acetate, and I'm happy to report that Advanced Bionutritionals has now developed the very first zinc acetate lozenge - Advanced Zinc Lozenges. Other ingredients: Fructose, hydrogenated vegetable oil, natural orange flavor, natural pineapple flavor, vegetable stearic acid, citric acid, silica, calcium stearate, rice concentrate, and licorice extract. First and foremost, Advanced Bionutritionals ensured that you get a full 15 mg of zinc acetate in each daily dose. At the first hint of a cold, simply take your daily dose of Advanced Zinc Lozenges as directed. Continue for six days, or until your cold symptoms disappear. You're likely to find that Advanced Zinc Lozenges slash the length of your cold in about half. Now I'm going to let you in on a secret… getting the dosing right was the easy part! The rest of the formulation took an entire year for them to fine-tune. The biggest challenge when creating the lozenge was taste. It's hard to mask the metallic taste of zinc acetate. It was especially challenging because we didn't want the lozenge to have a lot of sugar, or worse- artificial sweeteners! Advanced Bionutritionals did their best, and the taste is fine. But I'm not going to lie. You will still have a slight metallic taste and drying sensation on your tongue. But you know what? I take that as a good sign. That means the lozenge is working. Based on decades of research, Advanced Zinc Lozenges are hands down the best cold remedy available. I'm thrilled that Advanced Bionutritionals was able to keep the price comparable to what you'd pay for less effective lozenges anywhere else. In fact, Advanced Bionutritionals put together an offer for my readers that amounts to as little as $7.95 for a full course of treatment. I just did a quick comparison, and that is considerably less than the same amount of popular (but less effective) zinc gluconate lozenges. I'm so sure that you're going to be thrilled with Advanced Zinc Lozenges that you won't need their famous "down to the last lozenge" guarantee. If you aren't happy with Advanced Zinc Lozenges… if you don't feel like they're working… if anything about the product doesn't thrill you… just send it back within 90 days of your purchase for a refund. It doesn't matter if you've taken one day or the full week's supply. Just send back whatever you have left within 90 days and you'll get your money back. All of your money back. Every penny. Including shipping and handling charges! You only pay return shipping. That's right - we even refund the shipping charges! No questions asked. I want you to try Advanced Zinc Lozenges with the confidence of this unparalleled money-back guarantee. I want you to stock up for yourself and for your loved ones. I want you to be ready when cold season reaches full force so no one has to suffer needlessly. YES! I Want to Stop My Next Cold In Its Tracks! Please rush my risk-free supply of Advanced Zinc Lozenges right away! I understand that if I'm not absolutely thrilled with my results for any reason whatsoever, I will receive a full refund (including shipping!) with no questions asked. My Best Value is the 6 box pack, saving you $12.00. My cost is a rock-bottom $7.95 per box of 36 lozenges, plus shipping of $6.95. That's like getting nearly one and a half treatments for free! Please send me 6 boxes of Advanced Zinc Lozenges. I'll be stocked up and ready to keep my loved ones and myself healthy this cold season. I know that I can return the unused portion within 90 days of my purchase for a full refund. I want the lowest cost per box of Advanced Zinc Lozenges. Order right now and stay strong and healthy during cold season. Or call us toll-free at 1-800-791-3395 (our health consultants are available 24 hours a day, seven days a week). We'll rush you yourAdvanced Zinc Lozenges. ACT NOW! 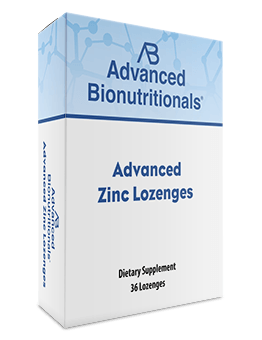 Order Your Advanced Zinc Lozenges Today!